This article is about Zelda's appearance in Super Smash Bros. Melee. For the character in other contexts, see Princess Zelda. “ A graceful princess with powerful magical attacks. 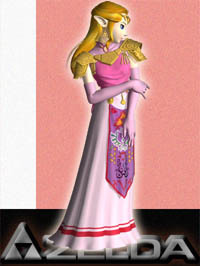 Zelda (ゼルダ, Zelda) is one of the more unique characters in the lineup for Super Smash Bros. Melee. Zelda's most notable traits are her array of powerful magical attacks and her unique ability to transform herself into her alter ego, Sheik. This alternate form is very different from Zelda, and each was intended to help balance the other's weaknesses, so that ideally one would change between the two based on the flow of battle. Currently, Zelda is 22nd on the tier list, in the F tier. Zelda's positive attributes include an effective KO move with her Lightning Kick, as well as several powerful attacks that possess transcendent priority. Zelda's primary weakness, however, is her poor mobility; she possesses (along with Jigglypuff) the slowest dash speed in the game, and is a slow-faller. These attributes combine with her very high traction, resulting in the shortest wavedash in the game (along with Peach). Additionally, despite Zelda's long range on her recovery, it is fairly predictable and easily edgeguarded and/or edgehogged due to its awkward ending lag. This contributes to Zelda having poor matchups against most of the cast, though she does have a few even matchups against some characters in higher tiers than her, such as Dr. Mario. Zelda does not fall under any specific archetype of characters, due to her unusual properties as a fighter; she has a slew of powerful finishers, such as her Lightning Kick, but she is of light weight. Additionally, Zelda has a slow falling speed and a high traction, leading to a very short, albeit fast, wavedash. One of Zelda's strengths is her surprising amount of power. Within the air, her forward and back aerials of the Lightning Kick can KO at as low as 70% to 80%, and her up air has a large hitbox that can also KO opponents. On the ground, Zelda's up tilt is surprisingly powerful (on par with Marth's up tilt), and its long duration and large radius allows it to be relatively useful under most circumstances. Zelda's up and forward smash attacks are also surprisingly powerful and they have high damage output due to their multiple hits. In addition, Zelda has some fast attacks, such as her down smash (which is the fastest in the game) and her forward and back aerials, both of which, as mentioned earlier, are among the most powerful in the game. As an added bonus, many of Zelda's attacks have transcendent priority; combined with an average reach in most of her attacks, Zelda has potential to stop others' attacks with her own. Also, despite her large number of high knockback moves, she has a quite decent combo game. Her dash attack is her primary combo starter on the ground, all of her tilts are great comboing moves, her forward tilt send her opponents backwards, this can set up a back Lightning Kick and even combo into itself, her up tilt can juggle at low percentages and follow-up with a up aerial when it stops comboing and her down tilt can combo into itself until around 95% and can also combo into her down smash. In addition to this, Zelda has a good grab game, having the 9th longest non-tether grab range in the game. Her up throw has chain throw potential at low percentages, and her down throw has several potential follow-ups, such as a dash attack, Lightning Kick, or even a forward tilt and can set up stage spikes and early edge-guards. Her forward and back throws are quite powerful and can set up edge-guards or even K.O. at high percentages. However, Zelda is strongly held back by her almost non-existant approach options. On the ground, Zelda has a slow dashing speed, a short wavedash, and a slow dash dance; combined with decidedly average range in her attacks, Zelda cannot effectively attack or counterattack on the ground. Zelda doesn't fare better in the air; despite an above average air speed, Zelda suffers from poor jumping height, a low falling speed, and a high short hop, leading to a very poor SHFFL. Zelda's lack of an effective projectile also prevents her from attacking from afar; Din's Fire is far too laggy, weak, and predictable to be an effective projectile. In addition to a poor approach on the ground, most of Zelda's moveset consists of unreliable finishers. Her forward and up smashes suffer from SDI problems, as opponents can easily SDI out of them before the last, most powerful hit can harm them. Zelda's up aerial, while powerful, is impossible to land on a grounded opponent, as it has some start-up lag and the hitbox is just above her. Her Lightning Kicks need to be sweetspotted to KO effectively and finally, her forward and back throws can only KO at very high percentages when used near the edge. As such, Zelda's up tilt and down smash are possibly her only reliable KO moves and even those have their flaws; the former is rather slow and the latter is rather weak for a smash attack. Zelda also suffers from having generally situational specials (save Transform). Nayru's Love can only harm attackers in short ranges, and it has high ending lag and it doesn't protect her from attacks above her. Din's Fire, as mentioned earlier, doesn't aid her approach at all and it too suffers from high ending lag. Farore's Wind, while covering long distances, lacks a powerful offensive hitbox on its start, and lacks one altogether when reentering, while the move also has awkwardly long ending lag, making Zelda very easy to edgeguard and/or edgehog. For a gallery of Zelda's hitboxes, see here. 2% (hits 1-3) Zaps magic quickly from her palm, in a similar fashion to Ganondorf's neutral attack. Has transcendent priority. 13% (hand), 12% (arm), 11% (shoulder) Swipes her hand forward with sparks. Has transcendent priority. Can be angled up or down. Second strongest forward tilt in Melee, only beaten by Bowser's sweetspotted forward tilt. 11% Waves her hand, filled with sparks, in an arch above her head. Surprisingly powerful. Has transcendent priority. 8% (leg), 7% (foot) Thrusts her foot out quickly from under her dress. Can meteor smash opponents who hit her leg and grounded opponents who hit the tip of her foot. Airborne opponents who hit her foot will be launched upwards. 13% (clean body), 9% (clean hands), 8% (late body), 7% (late hands) Shoves her hands in front, with magic sparks coming out them. Has transcendent priority. 1% (hits 1-4), 14% (hit 5) Sends out a fierce jab of magic in front of her in a similar fashion to Mario's. Hits multiple times, with the final hit having launching opponents away. This attack can be SDI'd out of, which is somewhat difficult to land all 5 hits. Has transcendent priority. 1% (hits 1-11), 5% (hits 12) Waves her hand in an arch similar to her up tilt three times. A powerful move if all hits manage to connect. Can be SDI'd out of, similar to her forward smash. 11% Quickly kicks both sides of herself. Short range with a sightly disjointed hitbox and poor power, but fast. Has transcendent priority. Zelda's leg is intangible when she delivers both kicks. 2-3% (hits 1-5), 5% (hit 6) Spins in place while emitting magic sparks from her hands. Many hitboxes, good for spacing. Has transcendent priority. It may be DI'd out of. Lightning Kick 20% (sweet), 10% (sour) Kicks forward. If the opponent is hit at the tip of Zelda's foot, it zaps them very powerfully, in a way similar to Captain Falcon's Knee Smash. Has transcendent priority. Lightning Kick 20% (sweet), 10% (sour) Virtually identical to her forward aerial but in a different direction and with slightly more startup lag. Has transcendent priority. A bit faster than her forward Lightning Kick, so it can be used twice in a short hop. 13% Releases a giant fireball upwards. Has good power. Has transcendent priority. 7% (foot), 8% (leg) Thrusts her foot downwards. A very weak meteor smash. 12% Launches her foe forward, above average power. 11% Similar to her forward throw, only directly behind her. 11% Thrusts foe to the sky. Has the ability to chain throw fast-falling opponents at low percents. 2% (hits 1-4), 2% (throw) Drops foe and zaps them, sending the foe behind her with weak knockback. 6% (front hit), 8%/6% (back hit legs/body) Swirls her dress around with foot extended and gets up. 6% Swirls her dress around with foot extended and gets up. 6% Climbs up and swings her legs in a circular motion, while pulling herself up. 10% (arm), 8% (body) Slowly gets up and slaps forward. Nayru's Love 1-2% (hits 1-5), 4-5% (hit 6) Twirls around with magical hitboxes on both sides. The attack also reflect projectiles. Din's Fire 7-13% Launches a controllable fireball that charges as it travels until it explodes. The fireball can be directed up or down with the control stick. This move puts Zelda in a helpless state when used in the air. Farore's Wind 4% A yellow ribbon of magic spins around Zelda, causing her to disappear. After that, she will reappear in the direction held on the control stick (or directly above her original location if the control stick is not moved). Due to a programming error, the hitbox for reappearing does not appear. Holds her hands together, as if in a prayer. Zel-da Zel-da Hu! Zel-da! Zel-da! Praying, she then turns her head upward. Looks to her left, holding her left arm proudly. Focuses, then conjures a flame between her hands. Zelda has a very subpar and poor matchup spread. She is hard countered by 2 characters(including her alter ego Sheik), countered by 8 characters, and soft countered by 5 characters. On the plus side, she has 3 even matchups, while soft countering 7. Zelda does terribly against characters who have much higher range and movement speed than her, most notably Fox, Marth, and Sheik. Ironically, Sheik is considered to be arguably her most troublesome matchup, because Sheik has a multitude of tools to counter her wonky recovery, and vulnerability to edgeguards. Sheik also has useful options to KO her by using a timely down throw, aerials/tilts, or her deadly needles, and has the agility to harshly punish any mistakes made by her. Fox can also do some serious damage to her with blinding speed and powerful combos. Yet, he also possesses a 0-death on her using his shine, which leads to another challenging matchup for the princess. She similarly struggles with characters who can KO her off of the top blast lines, exploit her abysmal approach, or edgeguard her with ease, such as Jigglypuff, Falco, Captain Falcon, or Pikachu. To add further issue to Zelda, she loses against a huge number of fighters(nearly every one ranked higher on the tier list). Even worse, all of her winning matchups are either in the bottom tier, or are extremely weak in the current meta, with one notable exception being Yoshi. (In more recent times, Yoshi has had considerable improvements to his own metagame and has far more advantageous matchups than the current spread indicates, leading to Yoshi being a counter to Zelda) These include: Kirby, Bowser, Pichu, Ness, Roy, and Mr. Game & Watch. Even with her strengths, such as powerful moves, a good grab game, and fast attacks, she still struggles to viably compete against other characters(especially most of the top and high tier). Overall, Zelda is a rather poor character who is nearly non-viable in competitive play, and has notoriously weak matchups against the majority of the cast. The Lake - Ranked 8th on Pittsburgh Power Rankings in 2017, peaked at 4th, 4-stocked Nintendude in a tournament match. Upke - A hidden boss on 2015 SSBMRank, 25th at Bad Moon Rising. Ice - When he mained Sheik and the opponent was on high percent, he sometimes switched to Zelda for a finishing back-air. Zelda was ranked extremely high on the first tier list, tying for 6th place with Samus and Luigi; however, discussion in the relevant SmashBoards topic suggests this is an artifact of some tier list contributors grouping her with her top-tier counterpart Sheik, and her placement was not fully based on her prowess as an independent character. The second tier list rectified this and had Zelda tie with Link and Ness for fourteenth to sixteenth place. Following this, Zelda fell again to 20th on the third tier list, and has since frequently appeared on the 19th and 20th spots on the tier list. Zelda's position can be attributed to her undesirable combination of traits, being floaty and light yet tall, and having very slow movement speed, a poor wavedash, and poor hitbox placement on most of her moves. In combination with Sheik being a constant in the top tier, this has deterred many smashers from using her in serious play. Zelda is currently ranked 22nd on the twelfth tier list, in what is her lowest standing on the list thus far. Prior to the ranking, she was ranked 19th, with some smashers disputing whether this was an accurate assessment; American smasher Mew2King notably believed that Zelda was one of the two worst characters in the game, citing her poor frame data in his assessment. Zelda has made little impact in tournaments from the start of the metagame, with relatively few dedicated mains. Her only modern players, Narcissa and The Lake, are semi-inactive and usually do not place high enough to earn money in large tournaments. Usually, the only time when Zelda shows up in top level play is when Sheik players transform into her off-stage to take advantage of her longer recovery where they would otherwise not be able to recover; if the opponent is aggressive enough, they may be forced to fight as her until an opportunity to transform back is available. In the Classic Mode, Zelda can appear in the ordinary 1 on 1 battles, on a team with either Link, Marth, Young Link, Peach or Bowser, or in the game's metal battle. In her appearances, Zelda appears on Temple, though she appears on Great Bay when with Young Link, and on Battlefield when with Bowser and in the metal battle. Unusually, however, Zelda will never appear as an ally in team and giant fights. Zelda's sole appearance in the Adventure Mode is in the second portion of Stage 3, the Underground Maze. The player has to fight against her on the Temple stage to progress in the mode. In All-Star Mode, Zelda and her allies are fought on the Temple stage. Event 20: All-Star Match 2: Zelda is the third opponent the player must fight in this series of staged battles. Their character battles her on the Temple stage, and the player's character has 2 stock while Zelda has 1. With a timer of four minutes, the player must defeat her and the other four characters with the overall time and life they have: Samus, Link, Captain Falcon, and Fox. Event 29: Triforce Gathering: The player plays as Link with Zelda as their partner, both of whom have one stock. They face Ganondorf on the Temple stage, who has two stocks. Clearing the event allows the player to unlock Ganondorf. Zelda and Sheik share ending images for the one-player modes, as well as the same cinematic; clearing the mode with one also gives the player both of their trophies. The crown princess of Hyrule. Zelda entrusted Link with the future of Hyrule after a revelation came to her in the world of dreams. She knows much about the Triforce; in fact, the only person who likely knows more about Triforce lore is Ganondorf himself, whom Zelda evaded in Ocarina of Time by transforming into her alter ego, Sheik. Zelda is the only character with the ability to transform into another character in Melee, and the first to do so in the Smash Bros. series, by being able to turn into Sheik. Pokémon Trainer in Brawl would later have the ability to "change" fighters by switching out different Pokémon, and Samus would gain the ability to change into Zero Suit Samus through her Final Smash. 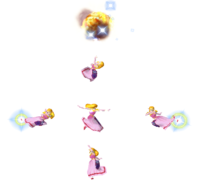 Zelda is the only character in Melee, along with Peach, to have 3 idle poses. The majority of the cast only have one. Also, her official artwork and character select portrait is based on one of her idle poses. In a screenshot of the character select screen in Melee, from Smabura-Ken, Zelda's portrait is missing from the character select screen. This seems to have been done to hide the surprise of Zelda being playable, as Sheik was revealed first. Zelda has the largest amount of moves with transcendent priority in Melee, with 13. Despite her design being based on her Ocarina of Time incarnation, if one looks closely, Zelda wears heeled shoes instead of brown boots as seen in the non-Smash trophies (which are retained in her later designs/appearances). Despite her Ocarina of Time being retired after Melee, subsequent games featured a subtle reference to her design from this game, including having Zelda sport an alternate costume based on her design here: Brawl had a sticker, 3DS had a trophy, and Ultimate had a spirit. Wii U is the only game since her debut that does not feature a direct reference to Zelda's design from this game. Oddly, a CPU Zelda in Training mode set to the "Stand" CPU mode will still occasionally transform into Sheik. This page was last edited on March 30, 2019, at 15:30.